Solar Impulse: "Our world is living in the past"
Bertrand Piccard is a pioneer of the skies and is the first person to successfully travel around the world aboard a solar airplane. The 59-year-old Swiss pilot describes himself as a "savanturier" ("a wise adventurer") who dreams of flying fuel-free and wants to change our paradigm of consumption. What he didn't know was that his project actually started as soon as he landed. Cafébabel: You are the architect behind the Solar Impulse project. How did you come up with the idea of a solar airplane? Bertrand Piccard: During my 1999 trip around the world in a hot air balloon, I was constantly scared I would run out of fuel. I had to burn propane every single day in order to stay in flight. The entire trip lasted 20 days, not including stops. Of the 3,7000 kilos of liquid propane I had at the start of the journey, I only had 40 kilos left when I finally landed. That's when the dream of flying fuel-free began, of being able to change the paradigm of consumption. To no longer have a fuel gauge, free of limits, and to achieve endless flight. Cafébabel: The project was very expensive. Do you think that the model you used could be reproduced on a large scale? Bertrand Piccard: Everything depends on what you mean by very expensive. Over the span of 15 years, the project has cost as much as the transfer of one single football player. What's interesting is that, in the same period of time, our project also cost 25 times less than a Formula 1 racing team. We had a team of 150 people, we created economic development through start-ups and SMBs [NB. small and medium-sized businesses], who were subcontractors. We also used marketing money from our partners for technological development, which made it possible for our partners to create economic development with their own clients. It's a very intersting 'business model'. Cafébabel: Is this business being reused today in aeronautics? Bertrand Piccard: Not only in aeronautics, but everywhere. Covestro [NB. a leading producer of high-performance materials and high-tech polymers] invented an insulating foam out of polyurethane that is 20% more effective than what we had before. Today, it is used for home and refrigerator insulation. Solvay [NB. an international chemical group] developed ultra lightweight materials that can to be used everywhere, for example a special solar panel encapsulation. All of these products have been marketed by our partners. Cafébabel: When you started, was this all just a personal dream or did you already have the idea of creating new technology that could be reused in the common market? Bertrand Piccard: Neither, actually. In the beginning, the goal was to have enough leverage to advance renewable energy and clean technology, using this incredible adventure as backing. I wanted to show that these technologies were able to accomplish things that were theoretically impossible, and get people to want to use them; to grab the attention of the political and industrial world. And it's worked out very well, which is exactly why I'm here today. Cafébabel: You said that clean energy goes hand in hand with economic profit. For you, what do you think is keeping producers from investing in that sector? Bertrand Piccard: The unpredictability on the legal level, which leaves investors and manufacturers in the dark. If you don't know whether or not there will be a carbon tax, it will be extremely difficult to come up with an industrial strategy. That's where there's a reverse phenomenon today. Before, it was the authorities that were ambitious and the industries that were hitting the brakes. Today, it's the authorities that do not dare assume responsibility because they are not sure what the problem is, and the industries are the ones doing all the pushing, from an ambitious legal perspective, which is where it also gets stuck. Cafébabel: Can the legal side of things go as fast as the development of new technologies? Bertrand Piccard: It’s clear that right now, the pace at which legislation is moving is so slow that innovation is going much, much faster. What's needed is for the legal side to stimulate the need for research; it needs to get things going. Now there is a third factor: industrialisation. If we push towards the industrialisation of these new technologies, what if Europe misses the boat because of highly complicated work codes or constraints on industrial development? By that point, Europe will be cleaner and we will have amazing innovation, but it will be produced by others, elsewhere. Cafébabel: You're a flying enthusiast. You said it yourself, you've travelled around the world in a hot air ballon, etc. What was the biggest difference aboard the Solar Impulse? Bertrand Piccard: The trip around the world in a hot air balloon was my own personal dream, which was about doing something that no one had ever done before. It was a competition with American billionaires, so I think it's funny that it turned out to be the little Swiss guy who won. Solar Impulse, however, was a necessary adventure on a whole other level. It's a project that has changed many people's view of clean energy. All of a sudden, people have woken up and realised: 'We have the possibility to do incredible things with clean technologies that don't consume fossil fuels.' That's really where the big difference lies; when it came to my trip around the world in the hot air balloon, that project stopped when I landed, whereas my trip around the world in the solar plane, the project began when I landed. Cafébabel: You were two pilots in the project with one spot in the cockpit. How was it collaborating with André Borschberg? Bertrand Piccard: We wrote a book together, Objectif Soleil [NB. Objective: The Sun, unofficial translation], in order to show how we learned to work together; to compliment each other, in synergy, rather than to be at odds, working against each other. When you see the complexity of the world today and the complexity of a project like Solar Impluse, you cannot work alone. When you work with someone who is very different from you, sometimes even the polar opposite, it forces you to re-evaluate everything, to be creative, because you systematically have other input that comes into play when making decisions. And working with André, we quickly realised that the solutions used for Solar Impulse were neither his nor mine. The solutions were brought by the friction of our two views of the world, which led to a third view of the world. I believe that's what made our project successful. Cafébabel: Of all the flight stages, which was the most memorable for you? Bertrand Piccard: I loved the second part of the Pacific between Hawaii and San Francisco. It was my first ocean crossing. It was also Earth Day on April 22 of 2016, and I was live via satellite telephone with Ban Ki Moon [NB: the Secretary-General of the United Nations] in the room where the Heads of State were signing the Paris Agreement. For me, on a symbolic level, it was incredible. 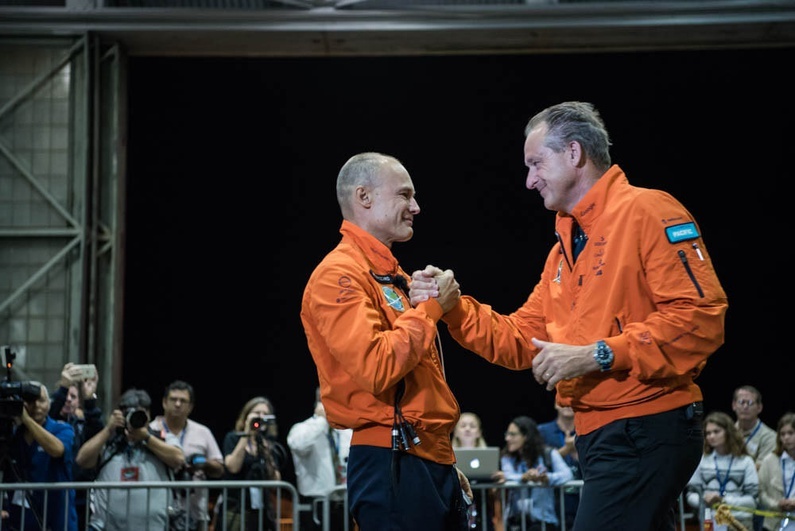 I had started this project with that exact goal in mind: to incorporate the pioneering spirit of the Solar Impulse project into the political conversation. I was over the moon with the success of the business I had led. Cafébabel: With the electric engines, the journey itself was supposed to be very quiet. That must have been amazing? Bertrand Piccard: It was a soft whistle. In the beginning, I felt like I was in the future, like in a sci-fi movie or something. Then I realised that Solar Impulse was not at all in the future, but that it was instead the world that was living in the past. 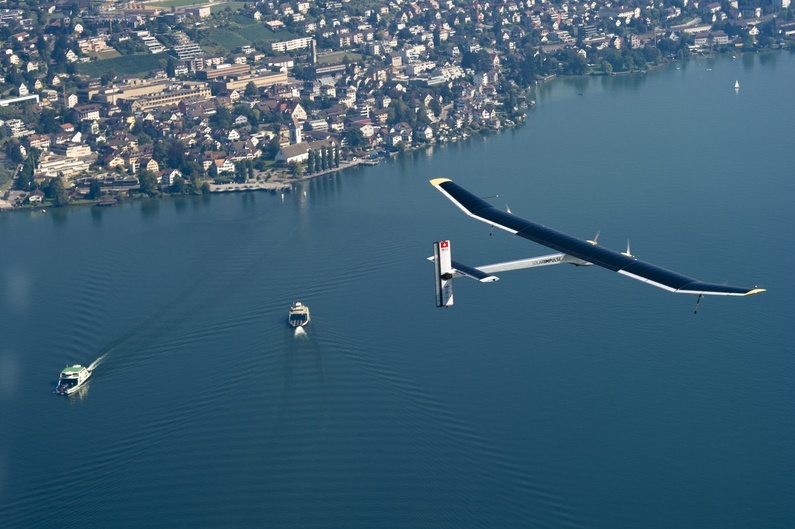 Solar Impulse is something of the modern-day, with its clean energy, solar batteries, etc. The rest of the world is living in the past with their thermal engines, poorly-insulated homes, archaic heating systems; it's sad really. Each landing felt like I was going back in time. Cafébabel: What would you say to the young people today who want to push the limits and open up people's minds? Bertrand Piccard: To speak the language of those who you are trying to convince. Don't try to speak the language of someone trying to protect the environment from industries that have to pay thousands of salaries at the end of the month. That's not what they want to hear. Don't talk long-term with people who have problems in the short-term. Don't talk about the beauty of nature to people that need to keep their businesses running. When it comes to protecting the environment, look at what is profitable in the short-term, what creates jobs, ensures security, makes it possible for politicians get re-elected. Highlight these aspects of protecting the environment in order to convince others, otherwise it will not work. It's great to have a long-term vision, but it also has to have [visible] effects already in the short-term. As I said today, you have to be logical rather than ecological. Interview done as a part of Sustainable Energy Week in Brussels.